The best pool alarm bracelet for children! The easiest way to protect your little ones around a pool is to know if they go in, right? Alarms can be turned off…or not recognize a child slowly walking into the pool. The only solution on the market is Safety Turtle. The “fun to wear” Turtle wristband will trigger the “always ready” system as soon as they get that wrist wet! Even if they just sit on the edge and put that arm in to play with a floating toy…you’ll know! It’s simple, reliable and easy to use! You can have as many wristbands as needed (for guests)…and your pets can utilize the very same system. The family dog wears a Turtle attached by a pet adapter, onto his collar. The kids and family pets can all be on the same system. The best part is you can take it with you to friends or vacation homes! There is no programming or wiring….just plug in and you’re ready! Works in salt water pools. Be safe, be smart, be sure! 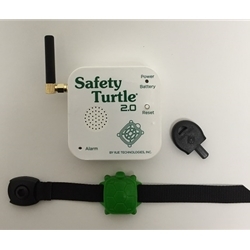 Get Safety Turtle for your family! Always watching…..always ready! Safety Turtle 2.0 is not compatible with older models. Fun design - Kids will wear! No information available at this time. Feel free to contact us for further information.